The World Sustainable Built Environment Conference 2017 (WSBE17) will take place on June 5-7, 2017 at the at the Hong Kong Convention and Exhibition Centre (HKCEC). This is the preeminent global conference on sustainable building and construction. Themed "Transforming Our Built Environment through Innovation and Integration: Putting Ideas into Action", this event is focused on both innovation and integration. 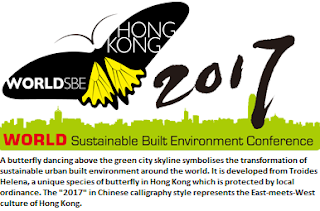 WSBE17 Hong Kong will bring together 1,800 green building advocates, policy-makers, academics, and industry practitioners from all over the world, offering an inspirational opportunity for delegates to "Put Ideas into Action" to transform the world's built environment. The conference will celebrate the continual efforts and achievements of different regions of the world in terms of sustainable built environments of various scales, with a particular emphasis on urban neighborhoods and buildings. There will be a gala dinner, youth competition, green building / eco tours and an exhibition. BEAM Pro & BEAM Affiliate can earn 19.5 Mandatory CPD Hours. This event is presented by Construction Industry Council (CIC) and the Hong Kong Green Building Council (HKGBC). This event takes place in Hong Kong one of the densest and most vibrant urban environments in the world. This is the perfect setting for conference participants to experience and discuss both the challenges and solutions involved in creating a sustainable built environment. Serving as a strategic gateway to Mainland China, Hong Kong also provides an unparalleled viewpoint for reviewing and discussing China's rapid urbanisation.